I have been on the hunt for cute home decor that is Fall appropriate, but also useful year round. I like versatile, so I am searching for home decor pieces that are girly, yet rustic, and function well with other Fall transitional decorations. Anyhow, hope you like some of my picks. 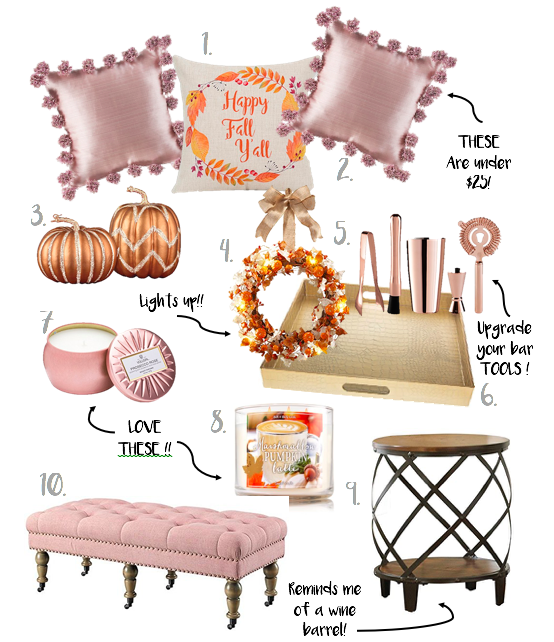 I'm so obsessed with blush pink and a dark wood combo- YES! Gimme a hot chocolate... and you can find me on my couch. Time for that cuddly weather! (okay, maybe I'll just turn up the AC and pretend it's not super hot in SoCal haha).